Walker Corporation has unveiled the proposed master plan for the $1.3 billion revitalisation of Toondah Harbour. The project will establish the harbour as the new and improved gateway to Moreton Bay, a tourism destination in its own right. Waterfront boardwalks, plenty of public open spaces, restaurants and parklands, all open to the public, will form the centrepiece of the redevelopment. The proposed plan includes a new ferry and tourism precinct, up to a 400-berth marina, increased residential living with a diversity of housing types, an exciting retail, entertainment and dining precinct, and a range of parks, plazas, boardwalks and recreational facilities. While the maximum height of any building will be capped at 10 storeys, low- and medium-rise development will feature strongly in a number of the character precincts, adding to the diversity of housing on offer. 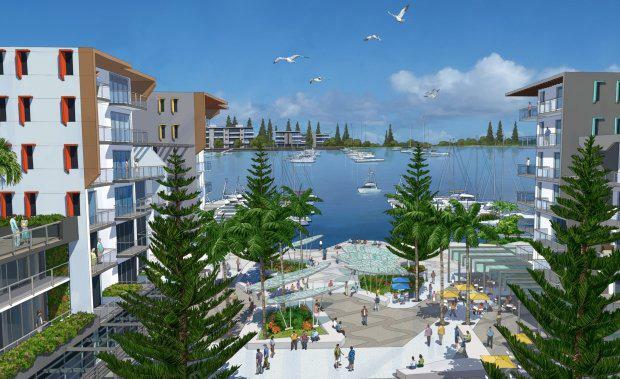 Walker’s General Manager of Queensland Development, Peter Saba, said: “The plan for Toondah Harbour being delivered in partnership with the State Government and Redland City Council was purposefully designed to increase public space, while delivering economic and community benefits for the Redlands. “We propose to deliver a world-class waterfront precinct that meets the vision for Toondah Harbour and makes the most of this outstanding waterfront location for locals and visitors alike,” Mr Saba said. This is a 15-to-20 year project that will deliver unprecedented economic benefits to the region. With the cost of construction estimated at $1.39 billion, the revitalisation of Toondah Harbour is expected to stimulate an additional $2.33 billion in economic activity. The project will support 1,000 FTE jobs per year in the construction phase, and 500 jobs per year on completion of the project. When completed, Toondah Harbour is expected to deliver an extra $96.5 million a year to the local economy, including $78.1 million in retail expenditure for surrounding businesses, including the Cleveland CBD, each year. “Walker is committed to delivering a project that the Redlands community can be proud of and will enjoy, while creating ongoing economic benefits for the region,” Mr Saba said. He said the design team had listened to feedback from the community and believed the proposal would provide a public and residential space that would transform an underutilised area into a vibrant waterfront destination, while retaining popular local infrastructure such as GJ Walter Park, and respecting the area’s community values. “We recognise the importance to the community of GJ Walter Park, which includes the dog off-leash area, the 104-year-old cricket field, koala habitat trees and the wonderful Norfolk pines,” Mr Saba said. The company has referred the project to the Commonwealth Environment Minister as the first step of a state and federal government environmental impact assessment and approval process. This phase follows more than two years of work by Redland City Council and the State Government to facilitate the priority development area project and gain the community’s views during consultations in August 2013 and January-February 2014. Mr Saba said: “We anticipate that during 2016 we will prepare an Environmental Impact Statement (EIS) report that will address all of the potential environmental, social and economic impacts of the project. There will be numerous opportunities for the public to have their say and we will be actively seeking community participation. A 10-business day public notification period for our EPBC referral will be underway this week.